It struck me and instantly caught my attention, more so because I was looking at pictures from the 2015 Paris marathon. I know the London marathon is the one where people dress up in costume and run the entire marathon in those costumes. I live in South Africa and I know that the rest of the world thinks that we have pet lions and we go fetch water from the river. The truth is, it may be the year 2015 but for thousands of South Africans walking kilometres to get water is still a reality. It has been years since I have seen somebody carry a plastic container on their heads, mainly because I live in the developed region of my country. I took time out from the interviews to highlight the reality that many people in my country face. This woman inspired me because she did it in such a bold manner. Walking the entire course of the marathon with a plastic tank on her head while wearing sandals while runners whizzed and passed her, probably throwing their empty water sachets on the ground. I can only imagine how that would feel knowing that back home what people take for granted we have so little of. 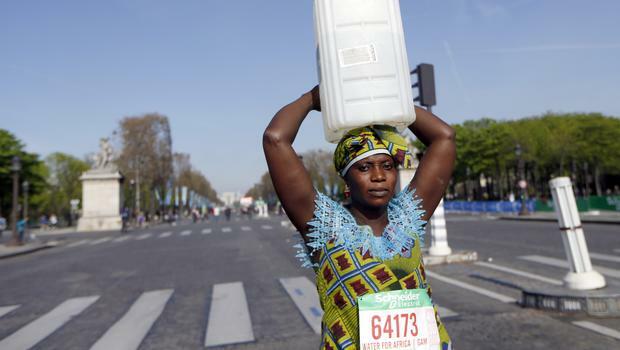 The next time you turn on your tap or grab a water sachet at a water stop, just take a moment to think about this woman who walked a marathon to highlight and show world media her reality.